Former Belton HS and current Baylor pitcher Sidney Holman sets to face a batter against Southern Miss on Feb. 17, 2019. The 16th-ranked Lady Bears won 4-3 to claim third place in the Getterman Classic. 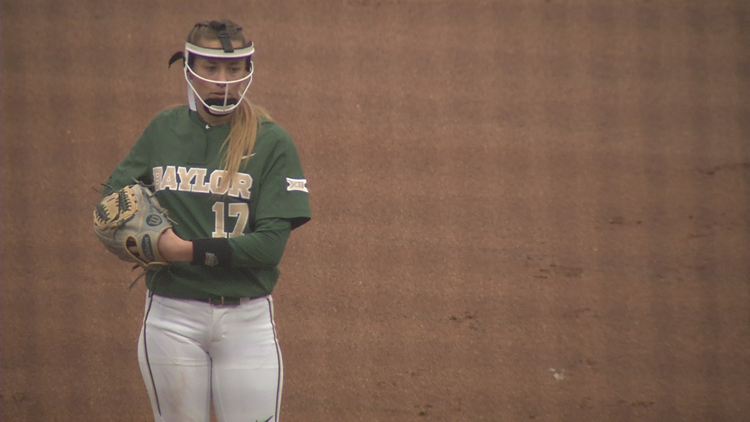 Lady Bears will hope to avoid the sweep Sunday at 1 p.m.
WACO, Texas — After tying the game up at two in the bottom of the fifth, Baylor (15-23, 2-10) couldn’t hold on as No. 15 Texas Tech (32-8, 5-6) used a big sixth inning to top the Lady Bears, 11-2, in run-rule fashion Saturday afternoon at Getterman Stadium. Baylor fell behind 2-0 through four innings but capitalized off Tech errs in the fifth to tie up the score. Hannah Smith led off the frame as she reached on an error by the Texas Tech third baseman. Then it was Ashley Marchand’s turn to reach base off another Red Raider error to put two runners on for Baylor with zero outs. Later on in the inning, Ana Watson got on board and then stole second to put two runners in scoring position with two outs. That brought Lou Gilbert to the plate who scored both of Baylor’s runs on Friday. Gilbert hit a single to second base that scored Smith from home. Smart base running by the speedy Watson allowed her to cross home plate safely and tie the game. Texas Tech loaded the bases with two outs in the second inning. Lou Gilbert fielded a grounder at shortstop and fired a throw to Goose McGlaun at first to end the inning and strand three Red Raider base runners. Sidney Holman finished with six strikeouts. Baylor went 2-for-2 on stolen base attempts Saturday afternoon as Nicky Dawson and Ana Watson each swiped second base. 2 – Lou Gilbert recorded the second multi-RBI game of her career on Saturday. Baylor and Texas Tech play in the series finale at 1 p.m. Sunday. It will be Dads and Daughters Day at Getterman Stadium.